The Skoda wins over the Focus on being the best car to own and speed from point to point according to Matt Robinson of Carthrottle.com. Here’s what he has to say. The Skoda Octavia vRS is one of those cars which, on paper, sounds damn-near perfect. Underneath its spacious and practical saloon-like hatchback body you get the same mechanicals as the very good VW Golf GTi, for a whole £3000 less than its VAG stablemate. So, it’s plenty fast, promises to be good to drive, is practical, and at £23,315, you’d need a very good reason to buy anything else if you want a brand-new mid-sized hot hatch on a budget. 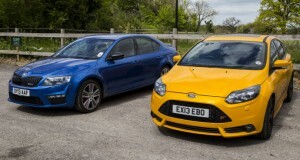 But, there is a very good reason, and that’s the £21,995 Ford Focus ST.